Rob N: This has to be the tattiest looking comic in my collection, which probably speaks volumes as to how often I read and re-read it as a kid. Sandwiched in-between my glossy Fine Plus to Very Fine vintage collectables, it skulks like a scruffy urchin who has wandered in by accident to an Eton School line up, with grass stains on his knees. It’s possibly my first ever Marvel comic, or if not precisely the first, then certainly close enough. I’d already bought a few DC titles previously because early ‘70s DC covers just begged you to pick them up and see what was inside, but soon enough I was experimenting with Marvel, and Thor #175 was possibly my introduction to the House of Ideas. And what an introduction it was! I think it was the Kirby interior art that did it for me, because looking through the pages again for the first time in decades, I’m struck by how dynamic and bright his art really is. It’s amazing to see how on top of his game Jack was towards the end of his tenure with Marvel (within a few months he’d be gone, taking up a new job with DC) when logically you might think he’d be turning in half-hearted work, simply meeting his remaining obligations until he was free to go and unleash his Fourth World concepts for Marvel’s rivals. But no, this is classic Kirby that also benefits from a period when Marvel's printing quality was first rate (contrast with the rather grubby looking printing of many mid- to-late '80s Marvel comics). As a first Thor comic for a seven year-old kid it pretty much ticks all the boxes and acted as a great introduction to the character as he was then. 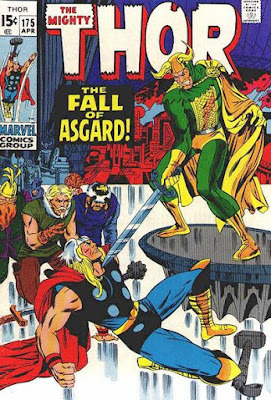 The cover depicts Thor at the mercy of his adopted brother, Loki, who seems to be occupying the throne of Asgard, for this issue plays on one of the familiar themes that recurred frequently in Thor comics during the '60s and '70s: that of Odin being a typically crap Dad. Throughout the early days of Marvel, Odin was perpetually doing one of two things - either losing his temper with Thor because he disapproved of his son's girlfriend, or going to bed and leaving Asgard to look after itself while he slept the ‘Odinsleep’. There was an editorial policy at Marvel in the early days that told writers to assume that each and every comic might be the first issue a new reader happened to pick up, and therefore characters and concepts were supposed to be made reasonably clear through subtle, or often unsubtle, examples of exposition. Flicking through the pages of this issue of Thor is a prime example of that methodology as the reader is introduced in turn to Thor’s powers (through an introductory fight with some criminals who dress like Don Draper from Mad Men – Kirby's gangsters always looked like they might moonlight for a Madison Avenue advertising agency), his comrades from Asgard (the self-explanatory Warriors Three, based loosely on the Three Musketeers of Dumas, who occupy just enough panel time to succinctly demonstrate their individual quirks to the reader) and of course his love life, the beautiful Sif, who appears suddenly to give Thor a chaste smooch (resulting in seven year-old schoolboy me thinking, 'Yuk! Kissing!') and to inform him that it's bedtime for Daddy Odin, so that Odin can recharge his immortality and, obviously enough, the moment that Odin settles down for a snooze, the evil Loki runs off and rounds up an army of mountain giants, trolls, gnomes, demons and other assorted boot boys for a full frontal assault on the golden Realm Eternal. Cue a glorious Kirby splash page that crackles with drama as the small figures of the Warriors Three watch in alarm from concealment as the titanic giants and a flying lizard parade past towards Asgard. Has Odin bothered to prepare for such a possibility? Of course not. Not only is he a rubbish Dad, he’s a pretty careless King who just assumes everything will work out okay in the long run, a bit like Brexit supporters. Luckily, Thor wastes no time in taking both himself and Sif off to Asgard (no more kissing, the seven year-old me was pleased to see) where he takes command of the Asgardian warriors. Already they are dragging heavy artillery over the Rainbow Bridge to meet and repulse the common working class troll scum who scrabble around Asgard’s walls with their lack of respect for an institutional monarchy. Sif hurries on to Odin’s bedside to personally command the guards there, for all the good that does, for after a few pages of Thor and the Warriors Three decimating Loki’s allies, Loki himself simply strides into the bedchamber unopposed and orders everyone to obey him. Quite why they do so is barely explained, for despite the fact that they’re at that very moment fighting his army, and supposedly guarding Odin’s sleeping body explicitly from him, they immediately acquiesce to his demands and arrest the protesting Sif. You can understand why she's a bit put out by this. The warriors all mumble something about, 'well, he's a son of Odin so I suppose we should just do what he says', while Thor hurries to the palace to confront his brother and put an end to his scheming. Loki has had enough time to seize the Odin ring which apparently grants the divine right of rule to anyone wearing it (you can almost understand why the trolls and mountain giants don't seem to respect the Asgardian institution of absolute Monarchy) and, because he is a dapper villain, change his outfit into something more slinky with a cape, like Thor's. By the time Thor fights his way into the palace, all the loyal warriors of Asgard, who only minutes earlier were fighting to bring down Loki, shrug their shoulders and accept he's in charge now because he's got a funky big ring on his finger. You can understand why Thor is a bit put out by this. Marvellous stuff, and by the time I reached that last page I'd decided that Thor was definitely my favourite comic book super hero.